The year, 2000, marked the beginning of a new millennium or thousand year period. People were excited and apprehensive about what the new century would bring. The 1990s had been prosperous years. Would the next decade bring the same? President Bill Clinton had served two terms, or eight years, the maximum time a president can serve. 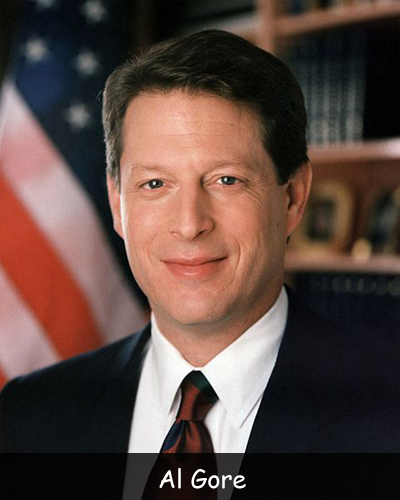 In 2000, his vice president, Al Gore, ran for president against George W. Bush, son of President George H.W. Bush. On election day, Al Gore gained a narrow lead in the electoral vote. He had 200,000 more popular votes than Bush – a narrow lead. Gore was declared president early in the evening. Later, Bush was called the president, winning by a slim margin in Florida, which gave him the lead. The race was so close that Al Gore asked the Supreme Court for a recount. The court began recounting the votes but decided four days later that there wasn’t enough time to do a proper recount. On December 13, 2000, Bush became the new president. The race was the closest presidential race in history. Democrats had held control of the White House for eight years, but now Republicans were in charge. Bush chose conservative Republicans to fill his cabinet positions. Many of these people served with Bush’s father. Clinton’s 2001 budget had a surplus of $184 billion. Bush wanted to use that money for a tax cut. Democrats were unhappy because most of the money from this tax cut would benefit wealthy Americans. The surplus wasn’t as large as anticipated. The stock market wasn’t doing well and the economy seemed to be slowing down. The years of prosperity were coming to an end. Facing a national economic recession and an energy crisis in California, Bush withdrew the U.S. from the Kyoto Protocol, an international environmental agreement. He said that he would do nothing that would hurt the economy. Instead, he created his own climate-change plan, asking U.S. industries to voluntarily reduce pollutants. He also wanted to build 1,900 new power plants in the U.S. that would be fueled by coal. Question: It seems like political parties seem to take turns in office. Why? Answer: Our political system of parties is far from perfect, but it does seem to keep things in balance. Democrats are known for increasing spending and government programs. They tend to do a good job of protecting the environment and human rights. Republicans are known for decreasing spending and government programs. They focus on preserving individual freedoms and liberties. People seem to naturally prefer a change in leadership every few years. Visit Congress for Kids to learn more about the electoral college. Declan, Tobin. " America Enters The New Millennium ." American History for Kids, Apr 2019. Web. 21 Apr 2019. < https://www.americanhistoryforkids.com/a-new-millennium/ >.